The IPTV Test Option for the QuickTest 500 IPTV Tester is ideal for the installation, maintenance and commissioning of IPTV services. The diagram below illustrates how testing can be performed on the customer’s Ethernet interface, the customer’ ADSL2+ access point, the street cabinet or the exchange. 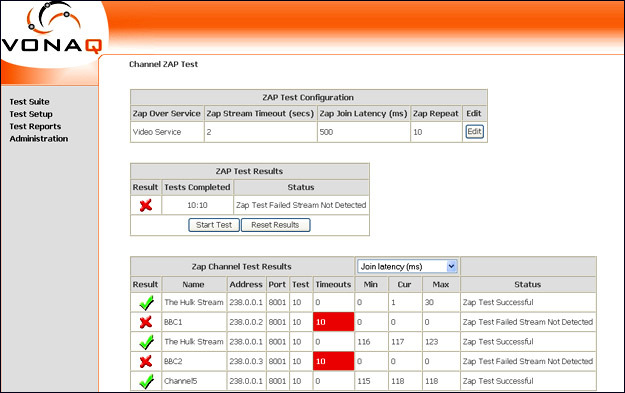 The QuickTest 500 IPTV Tester (IPTV Test Option) provides a clear breakdown of the active PIDs in the Transport Stream structure. Display of each PAT, PMT, PCR PID and PES PIDs is provided along with Packet Count, Error Count and Status. If any errors are present or problems reported in the Status, it is possible to view the specific details of that PID and PID type. Shown below is an example for a Program Map Table PID. To assist in pin pointing service affecting video problems, the IPTV Tester (Test Option) provides priority 1 and 2 measurement according to the ETSI TR101 290 standard.